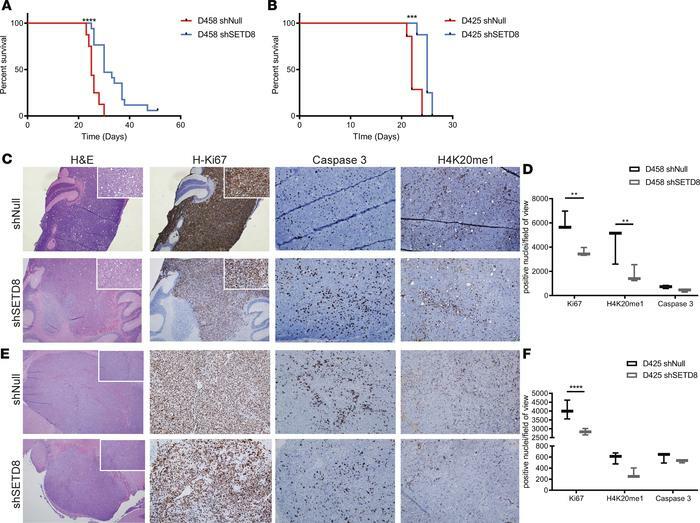 In vivo mouse model shows reduced proliferation and enhancement of survival. (A) Kaplan-Meier survival plot from intracranial orthotopic mouse model. D458 shNull (n = 17) and shSETD8 (n = 20) and (B) D425 shNull (n = 7) and shSETD8 (n = 8). Log-rank Mantel-Cox test; ***P < 0.001; ****P < 0.0001. (C and E) Immunohistochemical staining of cerebellar tumors from D458 shNull and shSETD8 (C) and D425 shNull and shSETD8 injected mice (E). H&E, Ki67, caspase 3, and H4K20me1 stains at 4× and 20× magnifications are shown. (D and F) Quantification of C and E. Box and whisker plots show minimum and maximum values from quantification of 6 representative images by ImageJ analysis. Unpaired t test; *P < 0.05; **P < 0.01.